Ray-Ban Aviators – These are a great everyday pair. I went with black for this frame, but they come in all the classic Ray-Ban shades as well. White heart shaped sunnies – I bought these for a shoot a few months back and can’t stop wearing them. I’d been loving the white sunglasses trend but knew I didn’t want to invest. These are only $10! Ray-Ban Hexagonal Flat Lens– My mother’s day gift that I can’t stop wearing. I love the classic shape and color of these, they seriously go with everything! 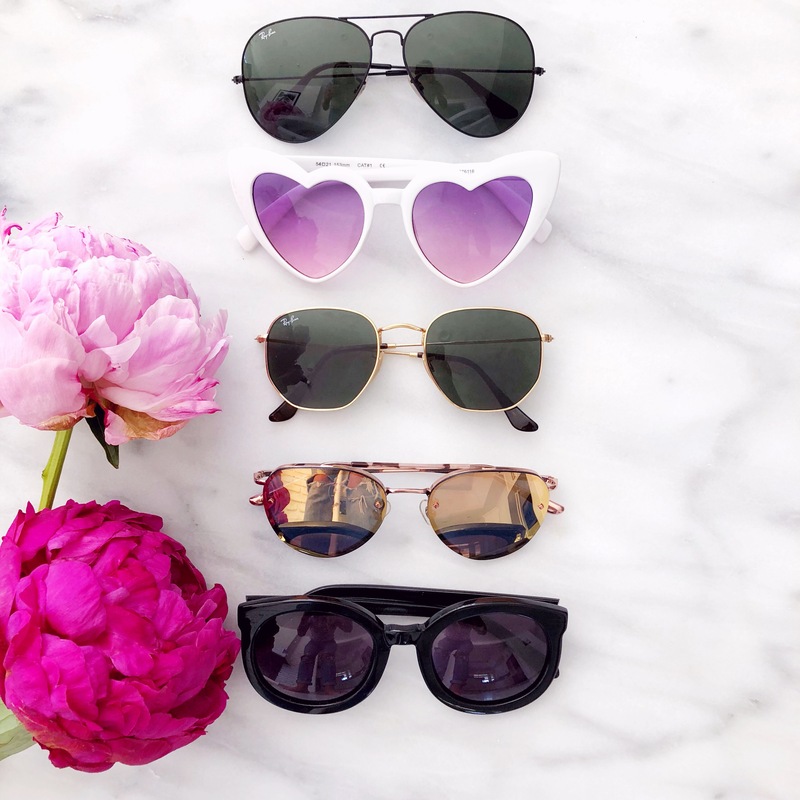 Rose gold aviators – these are from last summer and are no longer available but I found a few similar pairs (for a steal). These are only $14 and come in 5 other colors too and these are another great option for the same steal. Karen Walker Super Dupers – I splurged on this pair several years ago and they’ve been worth it. The frame is a bit heavy, so I don’t wear them for too long, but they’ve held up so well through the years. Hope you have a great week! I’m looking forward to getting Crosby and I back on schedule after two back-to-back trips and a mid-week holiday. We’re off to baby gym class! What cute sunglasses! They’re always the perfect accessory when you’re heading out for the day. XOXO.